Tomorrow - THE DRAGONS OF WINTER is here!!! Tomorrow's the day!! 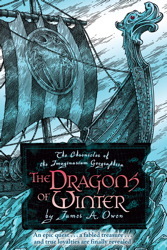 The sixth Imaginarium Geographica book, THE DRAGONS OF WINTER officially goes on sale - and while I will be doing launch events at the Desert Ridge Barnes & Noble (Scottsdale) and Changing Hands (Tempe) as well as being a GoH at Coppercon 32 (Avondale), there will NOT be a formal signing tour. There ARE going to be a few opportunities for events: I'm still doing school and library visits, and I may be painting murals at some point in Texas and maybe Tennessee. I'll also be having a local event at Crossroads Books later in September - but that's it. There are several reasons, but the biggest are 1) I have a LOT of work on my plate, a lot of which is for a project I am bursting at the seams to announce; and 2) I WILL be doing a HUGE tour next year for the big finish to the series. So everything in its time. But I wanted to post this here, so those of you in far-flung locales who want signed copies won't be waiting for a local signing. The best place to get signed - and personalized books - is going to be directly from us, here. We'll have our copies in about a week, and will start shipping them the third week of September. Outside of that, I hope my readers will support your local bookstore - and I hope you all enjoy reading THE DRAGONS OF WINTER as much as I enjoyed making it! "This is The Man. He is the true son of Hal Foster." - Ray Bradbury, about me. Foster was the creator of PRINCE VALIANT, and from childhood on, Ray's favorite writer/illustrator. No father could have spoken any prouder words to a son, and it meant the world to me to receive them. They mean even more now. And they'll mean even more tomorrow. God protect your rocket, Ray, on this new magnificent flight. I am heartbroken with joy to have known you as I did, and I will love you forever. The second volume of THE MEDITATIONS is now available!! The followup to DRAWING OUT THE DRAGONS, Book II of The Meditations, THE BARBIZON DIARIES – A Meditation on Will, Purpose, and the Value Of Stories is now available for sale at the Coppervale Marketplace, and will very shortly be up at Amazon and B&N.com. It is gorgeous, moving, inspiring, and wrenching, in all the best ways. Early readers have already responded with five-star reviews at Goodreads. This is the trio: pdf, epub, and mobi, all in one zipped file, so you can read it on any device. All the DRAWING OUT THE DRAGONS Kickstarter supporters will either be sent one directly, or given a link for a download. If DotD was my heart, this one is my soul – it’s the center of my personal mythology. Mythologies are huge, sweeping things. And the grandest stories are those with the widest arcs of triumph and despair. As much as we may want to, we may not be able to avoid the despair — but triumph is a matter of will. DotD was written for everyone, but THE BARBIZON DIARIES is an advanced course in surviving the Refiner’s fire — because some stories are too important not to share, and some stories are too meaningful to hide. If you find something of value in it, I hope you will post about it, on Facebook and at Goodreads, and send people to read DRAWING OUT THE DRAGONS. It’s the primer for this one, and really should be read first. Help me spread the word, and maybe, together, we can start some good trouble that will grow larger than what I can do alone. With luck, it’ll grow larger than us all. From the end of chapter nine of DRAWING OUT THE DRAGONS: "Some people see what I chose to do as 'enduring', but I think the idea of 'enduring to the end' is a terrible philosophy, and an awful way to live one's life. How you spend your days is how you live your life - and if you're spending them 'enduring' anything then you're doing it wrong. I feel the same way about regret. If everything in the past has value, then there's no reason for regret, ever. With no regret, and no fear, there's nothing left but possibility, and joy - and the realization that it is a wonderful world we live in, after all." We're getting close to 2000 downloads of the Drawing out the Dragons ebook. Some people have gotten the mistaken impression that it involves drawing dragons, which it does - but only slightly. What its really about is overcoming the obstacles and challenges we all face so that you can lead an extraordinary life. Everyone finds something different in it - have a look, and pass along the link. You'll be glad you did. The great Will Eisner once did a comics story that took place over ten minutes, and ended with the line, "What's ten minutes in a man's life?" It is, as it turned out in both the story and in many circumstances in the real world, very, very significant. Yesterday, I offered a free ebook of DRAWING OUT THE DRAGONS - A Meditation on Art, Destiny, and the Power of Choice, to everyone who chose to enter their name and address and click a download link. I stated as my goal that I would like to give away ONE THOUSAND books in twenty-four hours. And now, after just that ONE DAY, more than 1100 people have taken me up on my offer, and started reading the book that I consider to be the most meaningful thing I've ever written. In just one day, people have already begun to tell me that this book is changing their lives - and I am humbled, and grateful. And now I would like to share the reason that I chose to do this. My recent keynote address as the Guest of Honor at the LTUE Symposium at Utah Valley University brought the room to its feet for a long standing ovation, and for the rest of the day people shook my hands, and hugged me, and cried as they spoke, and thanked me for what I said in that presentation. It continued into the night at the restaurant where I ate, and at the signing, and then, at my hotel, via email. Some notes I got I was able to respond to in person the next day. Emily Adams, my Book Babe and handler for the day, is the only one I shared this with at the time, because I was still processing it, and wasn't sure... I wasn't sure how to encompass all the emotion that I felt in reading this one particular letter. Someone who may not even have been registered for the Symposium, but who was a fan, and nevertheless wanted to come, had attended the keynote. They intended for that to be one of the last acts of their life. One hour later, they changed their mind, because they believed I was speaking directly to them when I said, "I am here to say one of the most important things one human being can say to another - I believe in you. There is magic in the world, and I can show you where it is. And I will not let you fall." The next morning, this person wrote me a note to thank me for being there, and for saying what I did - and to tell me they had informed friends and family of their circumstance, and now people knew, and they were going to a hospital to get some help. And I cried, and bumped into walls while I got dressed, and then Emily and her hubby picked me up, and I went back to the Symposium, where I thought about the thousand different obstacles that had to be overcome for the Symposium to happen, and for me to attend, and for me to give that keynote address in that one hour, when that one person needed it more than anything. Ten minutes. One hour. One day. They are significant measures of time when they contain something meaningful. I wanted to do something meaningful that lasted more than an hour, and reached more people than I could reach on my own, and so I called upon you, my Dragon Army, to help me - and together we helped start changing the lives of more than a thousand people in a single day. You made something EXTRAORDINARY happen in just one day. What can you do with a WEEK? Here's the link. Pass it on - to EVERYONE. The books are here. And they are BEAUTIFUL. I'm commencing signing 2500 books, and packing prints, books, and bookmarks into packages to be shipped to you all as soon as humanly possible. There’s been a lot of discussion about your recent addition to Amazon of an app that people can use to scan items in stores – items which they are then asked to purchase from Amazon instead of at their local store. In addition to (in all probability) getting a lower price on the same item, they’ll also get five bucks for using the app. I think, as a business move, this is brilliant. As a PR move, it seems to have been a bit of a misstep. I’d like to make a suggestion to undo a lot of that PR damage, and in the same move give you some positive PR that will be all but unassailable by your critics. I’d like to suggest you create a new app – a seasonal one, that’s valid from the day after Thanksgiving until midnight on Christmas Eve. For the purposes of my suggestion, and because it’s the field I work in, the app would be limited to use in independent bookstores. With this app, which we could call “Santa’s Apprentice”, for any customer who scans a book in an independent bookstore – and then purchases that item at that store – Amazon would donate five bucks to a program that provides free books to kids at Christmas. You still get the market data that all the experts seem to think you’re after – but the independent bookstore gets the sale, and some kid who may otherwise be getting nothing under the tree will have a chance to get a beautiful book of their very own. I’m already doing something similar as an individual, but charities like Kids Need To Read would be an excellent recipient for those donations, and are practically primed to start just such a program. Making smart business choices has been the hallmark of your professional career, and it has certainly benefitted your company. Doing something like this is another arena altogether: it’s doing something that would not only help your competitors in a time of economic uncertainty, but would also help to give children some hope and happiness at a time in our world when both are sorely needed. And as PR, it’s as simple as Gimbel’s sending customers to Macy’s in Miracle on 34th St. It’s a move that generates both goodwill and profits. Too often, I’ve seen kids – who will never get a Christmas present – out on street corners at this time of year with their parents, who are selling decorated pencils, or other little odds and ends just to try to make ends meet. Those are the kids I’m going to be giving presents to this year – as many as I am able. And I can’t for the life of me imagine approaching such a kid and telling them, “I have the ability to give you a book of your very own for Christmas – but I can’t, because my shareholders wouldn’t like it.” I bet you couldn’t, either. Mr. Bezos, you have demonstrated beyond any doubt that Amazon is both successful and powerful. I hope you’re willing to demonstrate, to your own benefit, that Amazon can be good, too.